Panem may be a dystopian, near-apocalyptic wasteland, but for all its faults, it did one thing right. What's that, you ask? What could a country who sends its children to fight to the death in a public spectacle possibly do right? Well, on the shallowest of terms, it produced some really snazzy looking citizens. I'm not talking about the avant-garde Capitol dwellers, either. What I'm trying to say is, the Mockingjay, Part 2 cast have been posting pictures of themselves together on Instagram, and they're breaking hearts with both their camaraderie and their beauty. It's clear that just like us fans, it's hard for the cast to let The Hunger Games series — and each other — go. Sam Claflin has a serious case of wistful nostalgia, as evidenced by the yearbook-like Instagram caption he wrote on a group photo, which reads, "This isn't goodbye, it's a see you soon. 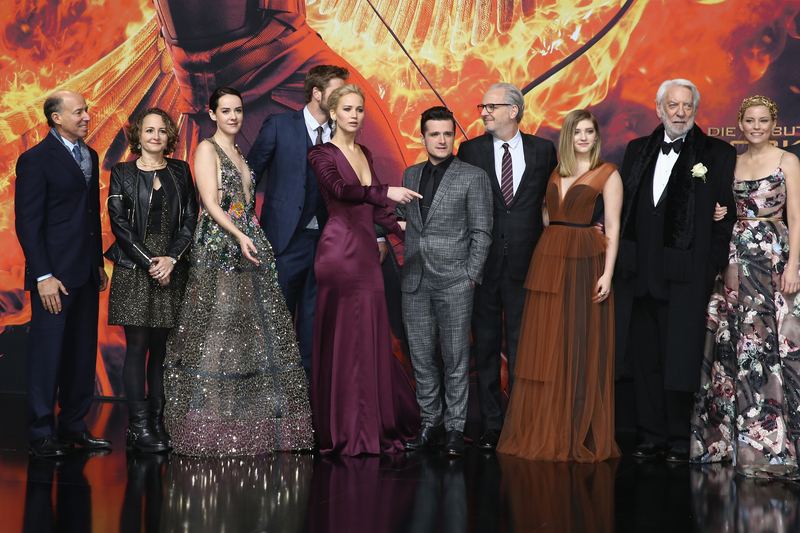 #friendsforlife #mockingjaypart2 #londonpremiere." In addition to Claflin, Elizabeth Banks and Liam Hemsworth have been posting a gratifying amount of pictures with the cast, as well. It's nice to have something to both tide us fans over until the premiere and reflect on after it's all said and done. And, you know, considering that these pictures won't actually be enough of a parting gift for me, if they're all up for a Hunger Games convention in a year or so, I'll gladly volunteer as tribute to moderate the panel. Until then, check out the pictures the Mockingjay, Part 2 cast has shared, below. SCRAPE ME UP OFF OF THE FLOOR. He just called them "besties." Excuse me, as I get each photo blown up and individually framed.